When Erica sent over the inspiration image for this round I died. Gray + menswear? Be still my heart! My favorite things! Also, I really really want that white dress. I loved my interpretation. Aaron also loved it, which makes this kind of a holy grail of outfits. 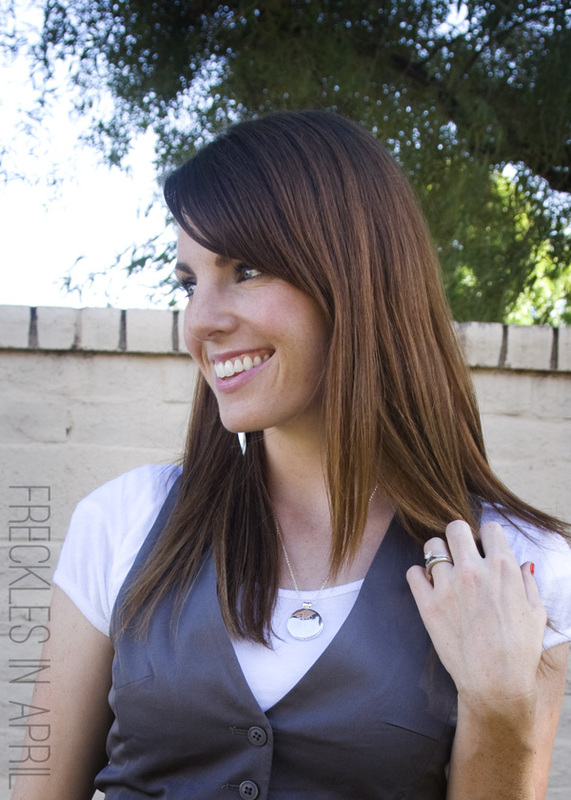 RedEnvelope sent me this gorgeous locket last week and I've worn it every day since. I've wanted a locket since I was...5? 4? I dunno, but it has been a dang long time and I'm thrilled to finally own one. It's engraved with my initials and holds pictures of my boys and I adore it. It's a perfect everyday piece. Grace is sitting out this round but head on over to Erica's and blog to see how she interpreted this one! ugh. you both look so great. and agreed on that DRESS. why I said ugh? bc I'm sitting here in something ugly. You look great! Love the pop of blue! As always, gorgeous. I love the look. It looks so effortless and easy but perfectly stylish. I think you've got a winner. CUTE CUTE CUTE. I love grey, and I love that vest! I need to pull mine out again and wear it with skinnies.